VIP Feature Page, BBC Homes and Antiques June 2008. As other artists use pencil, I use wire as a drawing material. It goes without saying that I am a hoarder of wire. Picking up a rusty piece of metal on a farm track, or finding a squashed electrical cable in a road, are for me, like finding little bits of treasure. Scrap yards are favourite place of mine the textures and piles of wire are very inspiring. I intentionally seek out old and interesting wires and like using rusty and corroded wires – the patina attracts me. By collecting wires I feel like I am collecting my lines with which to make my drawings – some are bold and thick like a marker pen, others are hair thin like the faintest of pencil lines. Born in 1974 Celia studied Fine Art Sculpture at Wimbledon School of Art. Having experimented with many different materials, wire became her favoured medium, with which she creates animated sculptures of birds. Growing up as a farmer’s daughter, Celia developed a passion for the natural environment and birds in particular are her inspiration. A lot of her time is spent drawing and studying domestic and native British birds from life, capturing their movement and character is her primary concern. 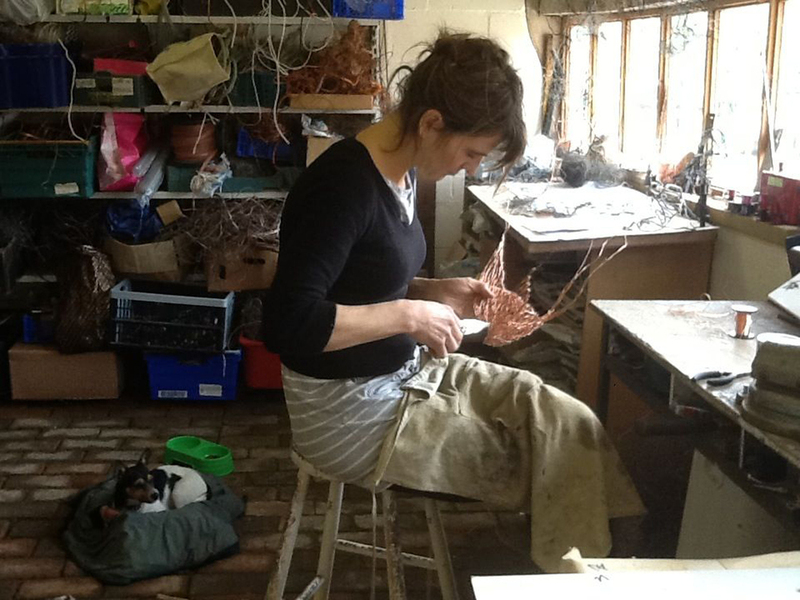 Celia draws with wire, as others draw with pencil, for her creating sculptures out of wire is like drawing in three dimensions. She will travel on location to sketch particular species in their habitat and often small wire studies and even life-size pieces are made directly in front of the subject.